Andrew Markle of The Bilerico Project is reporting that those fun loving, jackboot wearing, self loathing Republican Auntie Toms who called themselves GOProud are disbanding and will be shutting down IMMEDIATELY. “The organization may rebrand and regroup later, but for now, the organization will no longer be functioning. Co-director Matthew Bechstein stated in an interview that the “brand is broken” and a rebrand is necessary. GOProud which was originally founded by Chris “Shirtless Selfie” Barron and Jimmy “Cry Hate Crime” LaSalvia both left the organization over the past two years , and its been reported that GOProud has had some major scandals with its board and has bled its donors dry. Which leads one to wonder which one of the Koch brothers turned off the money spigot. 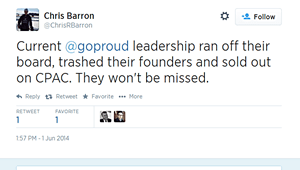 So as GOProud gets thrown into the trash heap like a used condom. Back2Stonewall would just like to say thank you for all the hysterical material that you have given us over the years. And for one last time say……..
You forget to point out the obvious Will. GOProud only had two or three members. Not much of a political action committee.